Aim: This study aims to evaluate the contrast sensitivity, color vision, and stereoacuity in amblyopic eyes. Materials and Methods: A prospective, cross-sectional, hospital-based study includes 64 amblyopic patients (79 eyes), with age between 10 and 30 years, which represents the study sample. Thirty-six normal individuals of same age group were taken as a control group. The history of the patients was taken; vision, objective, and subjective refraction were performed. Pinhole was used to determine the amblyopia. Color vision, contrast sensitivity, and stereoacuity tests were done for both groups. 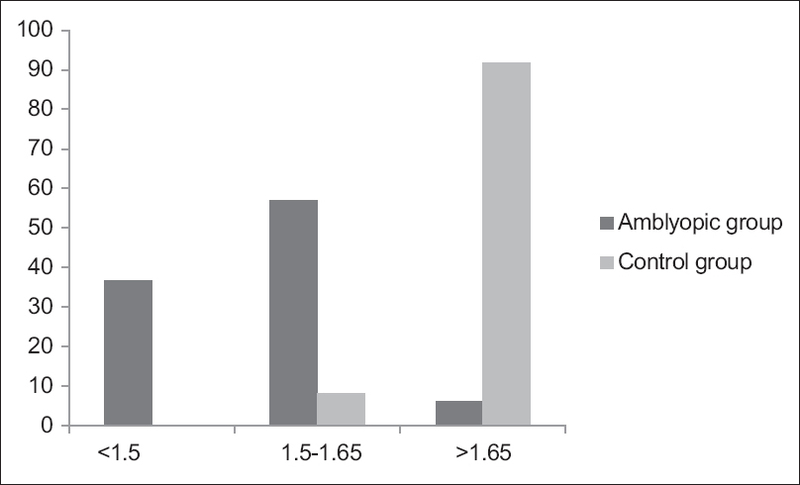 Results: Anisometropic amblyopia represents 51.5% of cases. Significant decrease in contrast sensitivity was detected compared with the control group (P = 0.000). 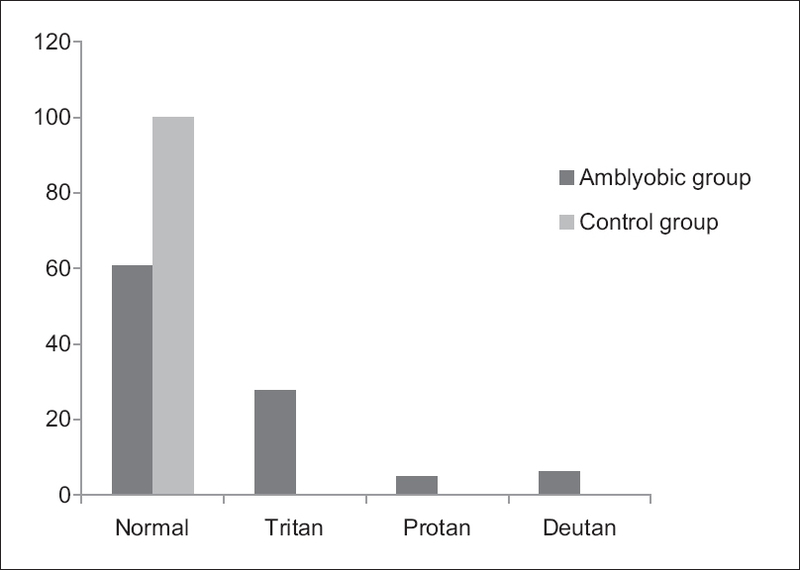 Color vision defect was found in 39.2% of amblyopic patients; 27.8% were tritanopes. Amblyopia affected stereoscopic vision in 48.5% of patients with mean 43.44 ± 95.17. Conclusion: Early detection of causes of amblyopia may prevent the bad Consequences. Amblyopia is the most common cause of monocular visual impairment in both children and young to middle-aged adults, affecting 2%–5% of general population.,, The resultant visual impairment among children affects approximately 2–3 out of every 100 children., There is evidence that detection and treatment of amblyopia before 5 years of age reduces the prevalence of clinically significant amblyopia to around 2%, and this percent reduced to 1% if the treatment is before 3 years of age. Strabismus is considered the main cause of amblyopia; usually, esotropia in infancy or early childhood. Binocularity and stereopsis are mostly affected in strabismic amblyopia; bilateral refractive error may cause amblyopia; isoametropic amblyopia occurs usually in children with moderate to high hyperopia. Anisometropic amblyopia is the most common cause. Myopic anisometropia rarely causes amblyopia although small degree of hyperopic anisometropia may lead to amblyopia.,, Media opacity such as congenital cataract during the sensitive period causes reduction in image quality and may result in amblyopia., The longer the duration of abnormal vision, the more profound the degree of amblyopia.,, Toxic amblyopia is an implication of nutrition deficiencies and some chemical agents. Amblyopia also may be heredity. It has been estimated that premature child is susceptible to amblyopia approximately four times more than others. Stereopsis is the perception of the three dimensions of object under binocular vision and occurs through fusion of signals from disparate retinal elements. Different tests are available for assessing stereopsis such as Titmus Fly test. The stereopsis is sensitive to disruption by amblyopia misalignment of visual axis and deprivation. Color sense occurs only in photopic condition; there are three type of pigments in different cone photoreceptors; many people are partially or completely color blind. Furthermore, the defect may be inherited or acquired deficiency. Congenital defect of color vision is usually binocular and symmetrical, while the acquired type occurs monocularly and fluctuated in severity. There are many tests to distinguish congenital and acquired color deficiency. Color vision impairment in amblyopia is due to toxic or other influences. Factors influencing outcome were classified into condition and treatment factors. Condition factors included type of amblyopia, age at treatment, initial severity of amblyopia, fixation, and binocular vision status. Treatment for amblyopia commonly involves passive methods such as occlusion of the nonamblyopic eye or compound with “active” because they require some activity on the part of the patient. There are different options for treating amblyopia in children, mostly depending on the type and severity of the condition. This targeted faction in this study was individuals with functional amblyopia, age between 10 and 30 years and had binocular vision. Patients who had ocular or systemic diseases or with pathological amblyopia were excluded from the study. Eighty-two of patients who consecutively attended orthoptic clinic at Makkah Eye Complex, Khartoum-Sudan, from May to July 2016, had been found to fulfill the requirement of the study. Only 64 individuals (34 males and 30 females) accepted to be included in this study. Thirty-six normal individuals (36 eyes) were taken as a control group. The aim of the study and examinations were explained for each patient. Demographic data (name, age, gender, and history of ocular and general health) were taken from the individual (or parent). The date of detecting amblyopia and previous treatment was recorded. Vision and visual acuity were measured by Snellen vision testing (auto chart). Nidek Auto Refractometer, AR310 Japan. was used to measure the refractive state of the eye. Pinhole was used to determine amblyopic cases. Occluder and fixation target was used to estimate the ocular muscle balance. Inner eye examination was taken from participant's card. Participant's binocularity was examined using project chart of Worth's four dot test. Pelli-Robson contrast sensitivity chart,Farnsworth-Munsell D15 color vision test, and butterfly stereo acuity test with Lea Symbol (2007 vision assessment corporation) were used for testing contrast sensitivity, color vision, and stereopsis, respectively. All tests were performed for the control group; color vision was done monocularly for both groups. The collected data were analyzed statistically by (IBM SPSS Inc. Version 20.0, Chicgo: spss. Inc, IL, USA). A total of 64 amblyopic individuals (79 eyes) were included in this study. Mean age of study group was 17.89 ± 5.89 and control group was 19.55 ± 5.91 (range: 10–30 years). Forty-six out of all amblyopic individuals were in 10–18 years age group. Mean of unaided vision of amblyopic group was 0.20 ± 0.15 which improved to 0.50 ± 0.21 after correction. Anisometropic amblyopia was the frequent type (51.5%), followed by strabismic (26.6%), isometropic (12.8%), and meridional (9.4%). Contrast sensitivity showed mean of 1.46± 0.25 compared with control group 1.70 ±0.02 [Figure 1]. Marked reduction in contrast sensitivity was found in 30.7% of isometropic type. There was a significant relation between the severity of amblyopia and contrast sensitivity (P = 0.000). Regarding color vision; 27.8% of patients revealed tritanomalous, 6.3% deuteranomalous and 5.1% protanomalous, while all control group showed normal color vision [Figure 2]. Isometropic amblyopia was less affected; two patients out of 8 showed deutan defect. Significant relation had been found between the degree of amblyopia and color vision defect (P < 0.01). Significant reduction of stereopsis was present in amblyopic eyes (P = 0.000), the mean was 143.44 ±95.17 (range: 40 – 400) [Figure3]. Patients with anisometropic type were mostly affected; 23 patients out of 33 had stereopsis result ≥100. Stereopsis was directly related with the severity of amblyopia. Amblyopia was found in 53% of males and 49.6% females, and 71.7% of the patients were ≤20 years, the results of which disagree with Ou xiao, 2014 who found no association with gender or age. Anisometropic amblyopia was present in 51.5% (33 patients), followed by strabisums amblyopia with 13.2%. This agrees with Black, 2011 who found that anisometropic amblyopia is more than other types, and also agree with Kocak, 2000 who found that most amblyopic eyes were anisometropic. This study showed that 48% of patients had visual acuity ≤0.6; in spite of that, vast majority of them had a previous treatment for amblyopia, this disagrees with Christina, 2015 who concluded that at 15 years age about 60% of treated amblyopia had visual acuity of 20/25 or better. Our result may be attributed to that Sudanese patients frequently do not regulate follow-up or stopped the treatment. When comparing contrast sensitivity in control group and amblyopic group, a significant difference has been found with P = 0.000. 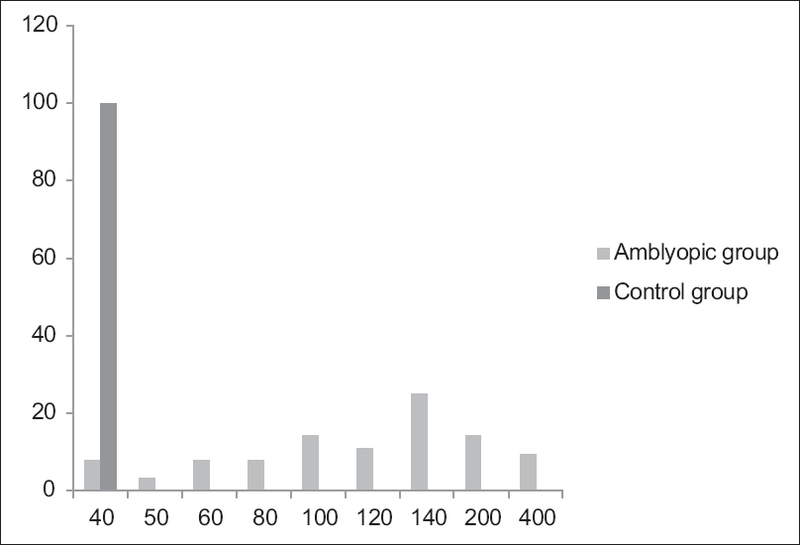 Contrast sensitivity of amblyopic patients showed mean 1.46 ± 0.25, while control group mean was 1.70 ± 0.02 and this result disagrees with that of Rogers, 2015 who said that contrast sensitivity function was similar for both amblyopic and nonamblyopic eyes. Significant relation has been found between severity of amblyopia and contrast sensitivity (P< 0.01); this result is compatible with that of Rogers, 2015 who said that there was a relationship between contrast sensitivity function and visual acuity; it also agrees with Song, 2015 who said: the more severity of amblyopia, the poorer level of contrast sensitivity. About 60% (48 individuals) of amblyopic group had normal color vision, while 34% exhibited tritan and deutan defect, this is consistent with Kocak, 2000 study which found that the total errors were blue-yellow and red-green. Strabismic and anisometropic amblyopia shows greater association with color vision defect and this disagrees with Hamideh Sabbaghi, 2015 who said there is no relation between type of amblyopia and color vision defect. Regarding the severity of amblyopia and color vision, a significant relation had been found (P< 0.01). This result agrees with Hamideh Sabbaghi, 2015 who said that color vision defect correlated with lower visual acuity and amblyopia (P< 0.005) but disagrees with Kocak, 2000 who said that deficient color vision in amblyopic eyes was not related to the severity of amblyopia. Amblyopia patients had reduced stereoacuity (P = 0.000) and this result agrees with that of Zou Mar, 2014 who found a significant decreased stereoacuity in children with amblyopia. Anisometropic and strabismic amblyopia showed a greater reduction in stereopsis than other types which agree with Zou, 2014 who said that the type and degree of amblyopia were closely related with stereopsis. Amblyopia is related to age and gender; it causes reduction in stereopsis, contrast sensitivity, and color vision. Anisometropic and strabismic types have a greater effect than other types. Webber A, Wood J. Amblyopia: Prevalance, natural history, functional effects and treatment, Clin Exp Opto,2005,88:365-375. Zia C. Step by Step Clinical Management of Strabismus. 1st ed. Newdelhi: Jaypee brothers medical pubishers. 2008. P. 2,7,10,24. Ziarate. B and Tejedor.J, Current concepts in the management of amblyopia. Clin Ophthalomol 2007: I:403-414. Wright Kenneth W, Yi Nng S. Strabismus and amblyopia. Pediatric Ophalmmology and Strabismus. 3rd ed. USA :Oxford University Press.2012. p:33,35. Sameera I. Undersstanding Strabismus. 1sted. Newdelhi: Jaypee Brothers Medical Pubishers ; 2014. P. 26-8. American Academy of Ophthalomlogy. Pediatric Ophthalmology and Strabismus. San-Francisco : American Academy of Ophthalomlogy; 2012. Millodot M. Dictionary of Optometry and Visual Science. 7th ed. UK-London: Butterworth-Heinemann;2009. Rosen FM, Nicla L, Edwards Keith H. Optometry Science, Techniques and Clinical Management. 2th ed. Edinburgh; New York :Elsevier Health Sciences:2009. P.180,194. Keane M. Encyclopedia Dictionary of Medicine, Nursing, and Allied Health. 7th ed. Philadelphia:Saunders ;2003. Taylor K, Elliott S. Amblyopia in Children: Treatment Options for Amblyopia. Cologne, Germany :Institute for Quality and Efficiency in Health Care ;2014. Ahyia LA. Amblyopia, Manual of Squint. 1st ed. Newdelhi: Jaypee Brothers Medical Publisher ; 2008. P.177,189.